NEW YORK, November 14, 2012 – Global Finance today announced the winners of its “Best Insurer Awards,” drawing on responses from just under 1,400 readers around the world, as well as input from a panel of 14 prominent risk management and financial executives at major companies headquartered in each geographic region of the world. In the global category, AIG was selected as the best insurer for property, environmental liability, employment practices liability, and cyber risk. Chubb won for best global D&O insurer and crime/fidelity insurer. Zurich Insurance won as best global political risk insurer, as well as global supply chain/trade disruption insurer. Euler Hermes was selected as best global trade credit insurer, and Aon, the best global supply chain/business continuity consultant. In addition to the global winners, the magazine recognized top insurers by coverage line and best overall brokers in six regions of the world, including US/Canada, Europe, Central/Eastern Europe, Latin America/Caribbean, Asia/Pacific, and Middle East/Africa. • Innovation/Creativity (ability to develop and offer meaningful solutions to risk issues). • Capacity, pricing and coverage terms. • Financial security/stability (as qualified by various ratings agencies, where available, and buyer or insurance broker perceptions when ratings are not available). • Reach (availability of underwriting or service resources on the ground in areas where risks exist and coverage is provided). • Service delivery, especially with respect to claims handling, but also in terms of pre-loss service capabilities, such as loss control. The weighting of the criteria was left to the respondents and panelists, as it is likely to differ by region and product line in accordance with available market security/financial information and regional insurer competition. 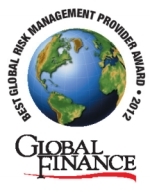 The results and profiles of the winners will be reported in the December issue of Global Finance .